Support half size 26.8mm and full size 50.95mm mSATA SSD; Support NGFF M.2 SATA SSD ( 2230 2242 2260 2280) with Key B & Key B+M; Support Hi-Speed SATA3/ 6Gbps mass storage interface. Read speed up to 520MB/s. 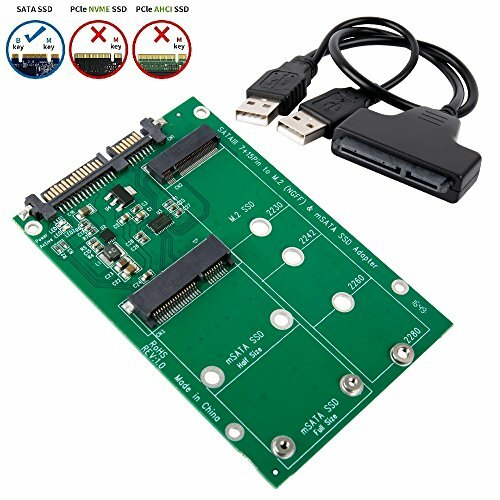 M.2 (NGFF) & mSATA to SATA III Adapter board. Green LED indicates power status; Red LED indicates active status; Thermal shutdown protection. It can be used as a bootable disk and requires no extra driver. It is suitable for both PC and Mac systems.